In order to stand beside flood-affected people, the Department of Pharmaceutical Sciences of North South University (NSU) and Pharmaceutical Club of the university jointly organised several relief and medical camps at several districts of the country. NSU Vice-Chancellor Prof Atiqul Islam inaugurated the relief and medicine distributing programme while Pro-VC Dr GU Ahsan, Chairman of the department Dr Hasan Mahmud Reza, Adviser of the club Nusrat Hossain, other faculty members and students were also present on the occasion, says a press release. 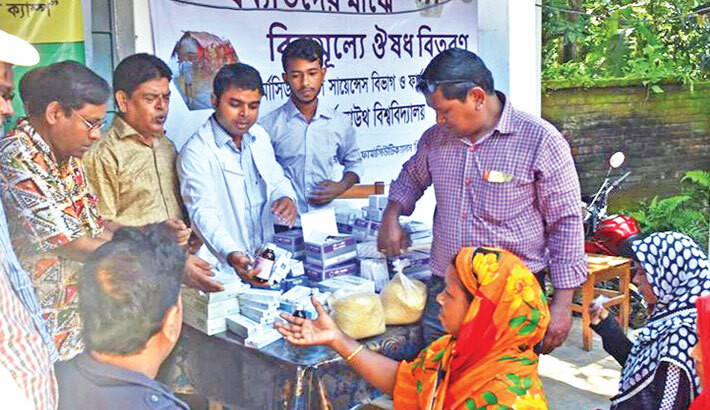 Faculty members and students of the department formed four volunteer groups and distributed saline, medicines, water purifying tablets and packets of dry foods among the flood victims in Gaibandha, Kurigram, Jamalpur and Faridpur. Almost five thousand families received necessary medicines along with a supply of dry foods. Followed by the relief distribution, the volunteers also enlightened the locals on taking necessary measures and the importance of drinking purified water during this crisis. This relief campaign was generously supported by a number of leading pharmaceutical companies of the country.